The 2012 Nissan GT-R will ride on newly designed forged aluminum-alloy wheels that are lighter and more rigid. TOKYO -- The 2012 Nissan GT-R, arriving next year, gets its biggest overhaul since the sports car was relaunched in 2007 -- with a premium placed on better horsepower and fuel efficiency. 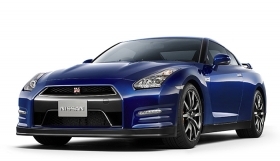 Nissan Motor Co. boosts engine output to 530 hp from 485 in the current model. At the same time, mileage improves to 20 mpg from 19.5, under Japanese testing standards. The latest GT-R, which goes on sale in Japan on Nov. 15, also gets a refreshed interior and exterior. Engineers tweaked the styling to reduce its drag coefficient to 0.26 from 0.27. Among the changes are bigger bumper and grille openings, rectifier fins on the front bumper to increase downforce and a redesigned rear bumper to lower its center of gravity. The 2012 GT-R also gets a carbon composite strut supporting bar in the engine partition wall to improve the body’s rigidity, as well as larger-diameter brake rotors to boost braking force. The car will ride on newly designed forged aluminum-alloy wheels that are lighter and more rigid. The car reaches the U.S. market after February 2011, but Nissan hasn’t announced precise timing. 10.18.2010 , FRANKLIN, Tenn. -- Following the global debut of the revised Nissan GT-R supercar in Japan today, Nissan North America, Inc. (NNA) announced that the new Nissan GT-R supercar will make its first North American appearance at the Los Angeles Auto Show on November 17th. The latest version of the potent Nissan GT-R, with enhanced performance and refreshed exterior and interior treatments, will be designated as a 2012 model when it goes on sale at select Nissan dealers in the United States and Canada early in the 2011 calendar year. Full details on the North American version of the Nissan GT-R will be available at the Los Angeles show. Information on the Japan market Nissan GT-R, which will be available in mid-November, was released today.